Yesterday (March 10, 2015), a verdict came in the closely watched copyright infringement lawsuit brought by the family of late soul singer Marvin Gaye against the creators of the monster hit “Blurred Lines.” A jury found defendants Pharrell Williams and Robin Thicke liable and a judge awarded Gaye’s children a reported $7.4 million in damages. Since the news broke, there has been a flurry of commentary about what the verdict means for copyright law, particularly whether the jury’s decision will lead to an uptick in lawsuits around songs that are similar in “feel” to an existing composition. Superficially, there are a lot of similarities, and the defendants readily admitted to having been inspired by Marvin Gaye. But is an analogous groove, rhythm or feel sufficient for a finding of infringement? The jury said yes, but others—including musicologists, music attorneys and even other songwriters—are not convinced. The fact that this case even went to trial is fairly remarkable. Many, if not most, infringement cases are settled out of court. In fact, the goal of a plaintiff might not be to go to trial, but rather receive a co-writing credit for future royalties, a cash settlement or even an injunction preventing the reproduction, distribution or sale of the work. This case was different, and attracted a great deal of pre-trial publicity due to the fame and stature of the defendants. In the course of his deposition, Robin Thicke tried to distance himself from the writing of “Blurred Lines,” and by most accounts did so in an embarrassing way. We don’t yet know how much, if any, bearing this had on the jury’s decision. At the heart of the case is whether the copyrightable elements of Gaye’s “Got to Give it Up” were infringed upon in the writing of “Blurred Lines.” When cases like this go to jury, things can get very interesting and the outcomes are often unpredictable. Most case law around musical works suggests that rhythms, grooves, beats and feel aren’t protected under copyright, but melody (and hook) can be more clear-cut. However, in Three Boys Music v. Michael Bolton, 212 F.3d 477 (9th Cir.2000), the Ninth Circuit upheld a jury decision in a district court that found Michael Bolton and Sony Music guilty of infringement of an Isley Brothers song, with damages set around 5.4 million. While the specific facts of these two cases are different, there may have been a similar process to determine liability. When the Ninth Circuit court considered “substantial similarity” between songs, it used a two-part test to determine “extrinsic similarity” and “intrinsic similarity.” The extrinsic test involves the examination of concrete elements based on objective criteria. This is where the musicologists have standing. The intrinsic test is more subjective and aims to determine “whether the ordinary, reasonable person would find the total concept and feel of the works to be substantially similar.” Pasillas v. McDonald’s Corp., 927 F.2d 440, 442 (9th Cir. 1991). We haven’t yet had the chance to dig into how the “Blurred Lines” jury weighed the evidence, but the case did feature some interesting procedural aspects. For example, the judge instructed the jury to only consider the musical work on file with the US Copyright Office. That makes sense, because the case is about the composition, not the recording. However, it is very difficult for an average jury to conjure up notes on paper for comparison, so there were some allowances made in the course of the trial. If you’re troubled by the fact that non-protected song elements were used as a basis for a verdict of infringement, it is important to remember that the “intrinsic test” does allow for such an analysis. In fact, previous rulings have found that these elements can combine to produce an overall effect that supports a determination of unlawful appropriation. In this case, it appears possible that the jury may have followed this logic. Whether the verdict is going to usher in a wave of lawsuits against songs that have a similar “feel” to existing works remains to be seen. There is certainly the potential danger that it will inspire suits based on the concept that the previous definitions have expanded. Remember, the point of bringing an action is probably not to go to trial, but to achieve a settlement. This verdict could have the potential of encouraging such activity. If the case ends up setting a legal precedent, it could also chill expression, if songwriters shy away from stylistic homages to earlier works. But before we get too freaked out, we should realize a jury trial doesn’t automatically create a binding legal precedent, and that this verdict may be appealed or subjected to post-trial motions. If it is overturned, nothing really changes; if the decision is upheld in an appellate court, well, we’ll just have to see. One thing that doesn’t get pointed out often enough in coverage of these high-profile cases is that infringement lawsuits seem to be mostly available options to those with deep enough pockets to bring a legal action. We’ve encountered a number of creators who don’t have the means to protect their works in the courts due to the high costs of litigation, despite much more clear-cut examples of infringement. This is something that needs to be discussed. We understand that this case is emotionally charged because of how people feel about both songs and their authors. And if this wasn’t a jury case, and we were the presiding justice, we’re pretty sure that we would not have found for the plaintiff. As previously mentioned, juries can be unpredictable on copyright issues. We’ll be watching close to see what happens with appeals and post-trial proceedings, but we’re not hitting the panic button just yet. Submitted by Bill Thomas (not verified) on March 11, 2015 - 3:26pm. 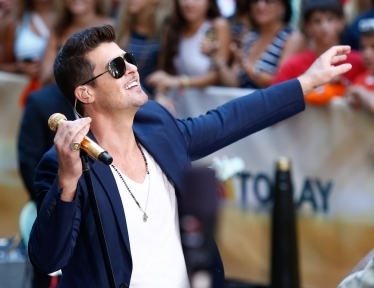 Very solid and well thought-out analysis of the "Blurred Lines" case. Submitted by kevin on March 11, 2015 - 4:35pm. Thanks Bill! That means a lot coming from you! Submitted by Anna K (not verified) on May 13, 2015 - 8:17am. Would you have the link for the original verdict available somewhere?